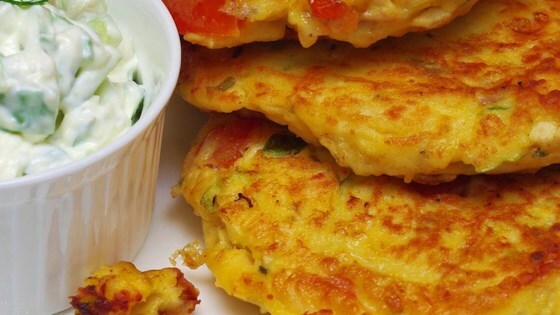 "These chicken veggie fritters are simply amazing! This is my second time making them. First was a trial, second I measured the ingredients so it can be repeated. Use this recipe as a guide; you can substitute or add ingredients according to what you have on hand. Perfect for kids and adults!" Mix shredded chicken, eggs, flour, tomato, green onions, cream cheese, dill, salt, and pepper together in a large bowl. Add additional flour if needed to create a thick batter. Heat olive oil in a skillet over medium-high heat. Add spoonfuls of batter and shape into circles using a spoon. Cook for 2 to 3 minutes on each side. Combine cucumber, sour cream, cream cheese, and dill together in a small bowl. Serve dip with fritters. Feel free to use cooked shredded turkey in place of chicken. Use any fresh herb you prefer. I did a med review because I haven't made it and nobody has posted a review. I will make this because it sounds amazing and I'll get back to you.